Beginning in 1968, the University of California, Irvine, was host to an experiment in intercultural exchange and artistic and social scientific learning through practice. Located on the edges of William Pereira’s California Brutalist campus, the Farm was a space for craftspeople from Guatemala, Mexico, and Samoa to demonstrate their skills; a laboratory for new methods in education and research; and an unexpected countercultural gathering site. 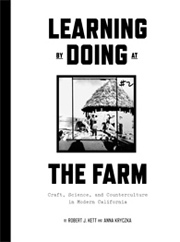 Learning by Doing at the Farm reflects upon this unusual experiment, which brought together Cold War politics, modern development, and indigenous peoples drawn into the strange intellectual and cultural circumstances of 1960s California. Through a critical introduction and previously unpublished archival documentation, this book offers a glimpse of various actors’ dreams of what the Farm could become and the collaborations that actually unfolded there. Robert Kett works in the Department of Architecture and Design at SFMOMA. Anna Kryczka is a professor of Humanities at Pasadena City College.